NEW ORLEANS – It’s Moving Week in the NCAA Division I Men’s Indoor Track & Field National Rating Index! This is the week where we tossed out all preseason marks and only used those pertaining to the current 2019 campaign to crunch the numbers. Well, not much changed up top as Texas Tech is still No. 1 in the most recent rankings released Monday by the U.S. Track & Field and Cross Country Coaches Association (USTFCCCA). Behind the Red Raiders, you’ll see new No. 2 Texas A&M, No. 3 Florida, No. 4 Houston and No. 5 LSU in the new-look top-5. Texas Tech remained on top of the mountain thanks to five performances that are ranked in the top-5 nationally, including Andrew Hudson’s nation-leading time of 20.48 in the 200. He and Divine Oduduru (No. 3 in the 200) form a potent 1-2 punch in the sprints for the Red Raiders, while Odaine Lewis holds it down in the horizontal jumps at No. 4 in the long jump and now No. 5 in the triple jump. The Aggies climbed five spots from Week 3 after a strong weekend at the Tiger Paw Invitational hosted by Clemson. Tahar Triki joined Devin Dixon on top of the national leaderboard when he notched a mark of 17.00m (55-9¼) in the triple jump. Speaking of Dixon, he dazzled the crowd two laps at a time. Dixon moved up to third on the Descending Order List in the 400 with his time of 45.68 and then clocked the fastest 4×400 carry in world history to close the meet. Grant Holloway continues to propel the Gators. Holloway clocked the second fastest time in collegiate history this past weekend in the 60 hurdles when he went 7.43, just 0.01 off the collegiate record he set last year. Holloway is the national leader in both the 60 hurdle and the open 60 to go along with a runner-up spot in the long jump and the No. 5 slot in the 200. Big points could come from the weight throw, too, as AJ McFarland and Thomas Mardal are ranked fifth and seventh in that event. The Cougars took a bite out of the competition this past weekend at the Tiger Paw Invitational. Houston received a nation-leading mark in the 400 from Obi Igbokwe (45.35) and then pushed its national lead in the 4×400 to 3:01.51, which is the fourth fastest mark in collegiate indoor history. Kahmari Montgomery anchored the Cougars’ 4×400 relay in 44.46. Not much changed for the Tigers as they still have a spot in the top-5. LSU has a pair of nation-leading marks: Mondo Duplantis in the pole vault and Rayvon Grey in the long jump. Rounding out the top-10 is No. 6 Georgia, No. 7 Texas, No. 8 Florida State, No. 9 Stanford and No. 10 Indiana. The biggest move in the top-25 was turned in by Ole Miss, which soared 74 spots from No. 92 to No. 18 after Waleed Suliman became only the second Rebel to break four minutes in the mile and moved into second on the Descending Order List in the event. 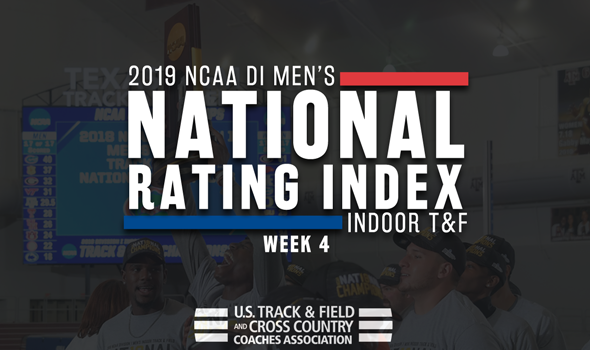 Be sure to check back in over the next month as the National Rating Index will continue to evolve ahead of the NCAA Division I Indoor Track & Field Championships on March 8-9 at the Birmingham CrossPlex in Birmingham, Alabama.